Pumpkin (Cucurbita moschata Duchesne, family Cucurbitaceae) is a vine like flowering plant originally from Central America and Northern South America. It is a monoecious, climbing, annual plant with alternate and simple leaves and bright yellow to orangey yellow flowers. Though it is a fruit, it is treated as vegetables. 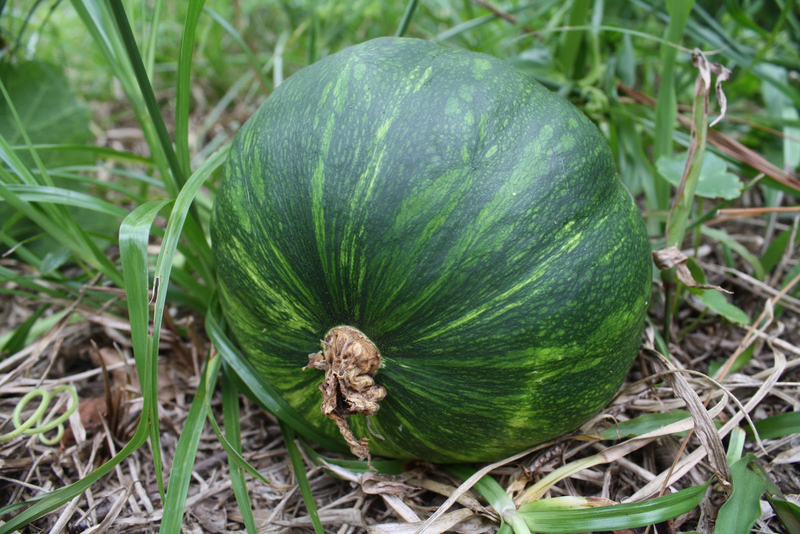 It is widely grown for its edible fruit named pumpkin. The fruit has smooth, hard skin usually with cream spots and bright orange flesh but sometimes greenish with many seeds. 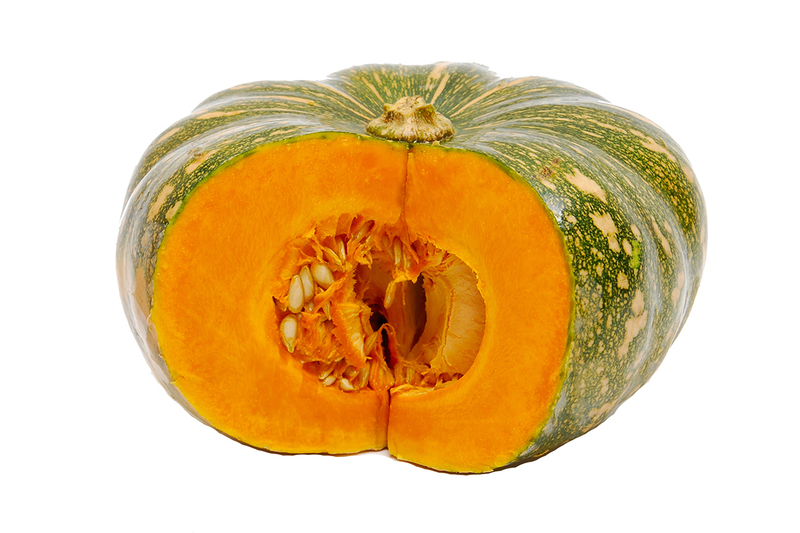 The common names for pumpkin are Butternut Squash, Golden Cushaw, Cheese Pumpkin, Melon Squash, Japanese Pumpkin, Musky Pumpkin, Musky Gourd, Musky Squash, Seminole Pumpkin, Musky Winter Squash, Winter Crookneck Squash, Tropical Pumpkin, Winter Pumpkin, Winter Marrow, Winter Straightneck Squash and Winter Squash. 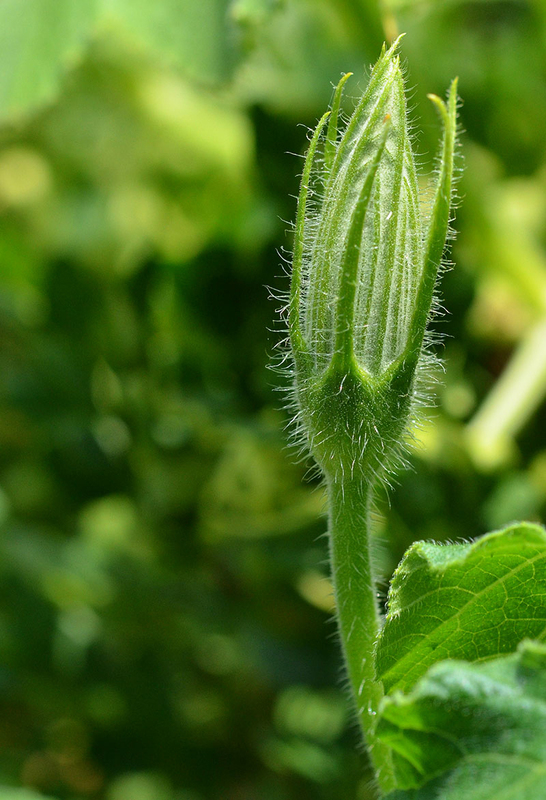 Pumpkin is a creeping vine which has large alternate, simple, ovate-cordate- suborbicular leaves of 20–25 × 25–30 cm. 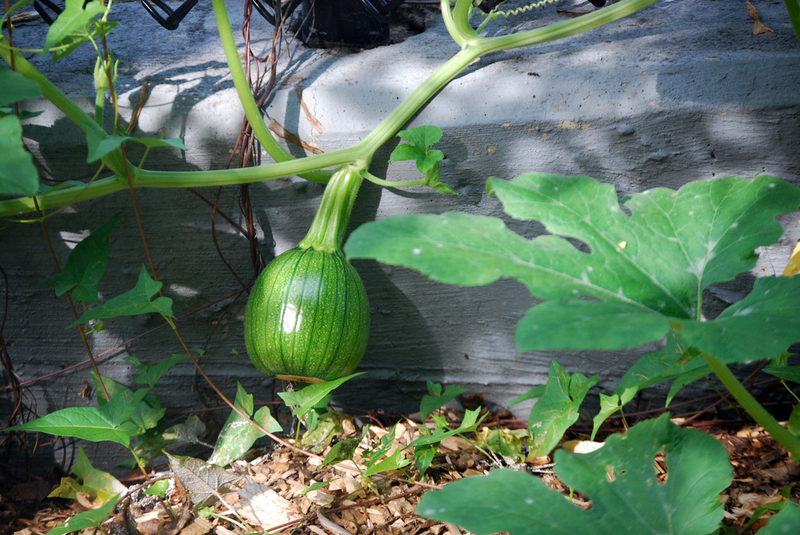 The fruit of the pumpkin is large, globose-ovoid and cylindrical berry. The fruit is light green- dark green with cream spots or completely white. The stems are hairless, climbing vines which is 3 meters high. The plant bears flowers that are pentamerous, axillary, solitary, bright yellow or orangey yellow. The seeds present in the fruit are of ovate or elliptical; flatten with a yellowish-white surface of 8-21 × 5-11 mm size. Pumpkin also known as Butternut Squash, Golden Cushaw, Cheese Pumpkin, Melon Squash, Japanese Pumpkin is actually a creeping vine that has large alternate, simple, ovate-cordate- suborbicular leaves of 20–25 × 25–30 cm. Leaves are normally dark green color and has taste similar to a mixture of green beans, asparagus, broccoli and spinach. Because of its wonderful taste it is found used in several food items since ancient times. Click here for nutritional value and health benefits of Leaves. Pumpkin is a monoecious, climbing, annual vine which is found growing in hot and humid climate and normally prefers well drained soil which is rich in organic matters. 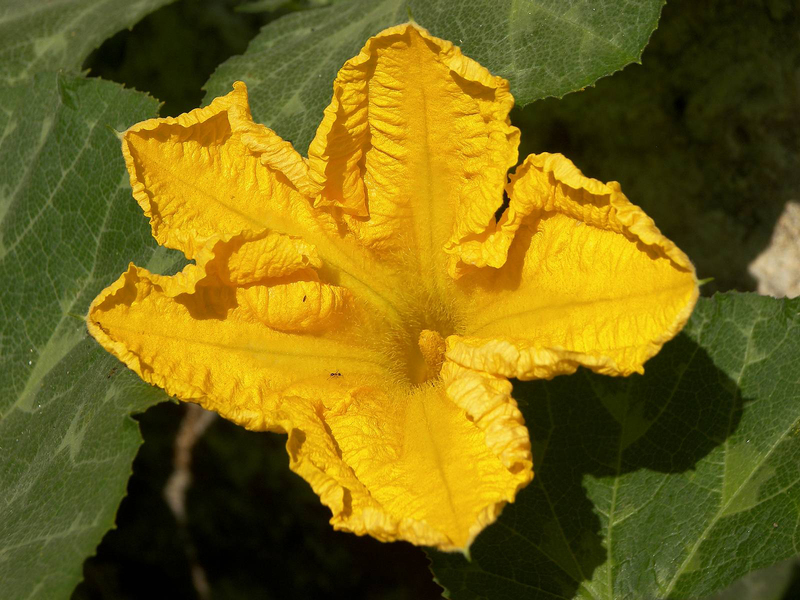 Flowers of the pumpkin are pentamerous, axillary, solitary and is bright yellow or orangey yellow colored. Due to its higher nutritional value and its wonderful taste it is one of the popular vegetable around the world. Click here for nutritional value and health benefits of Flowers. Pumpkin was originated in Mexico and Central America. 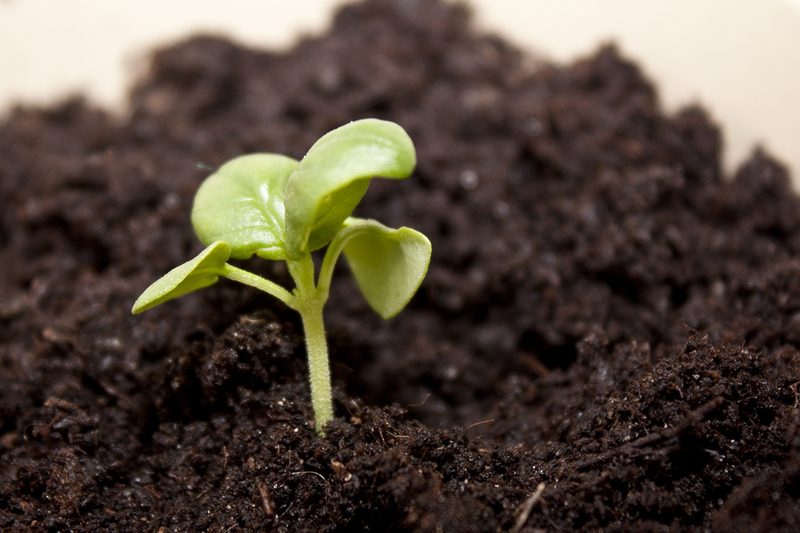 Before the Europeans arrival, it was widely cultivated in South and North America. 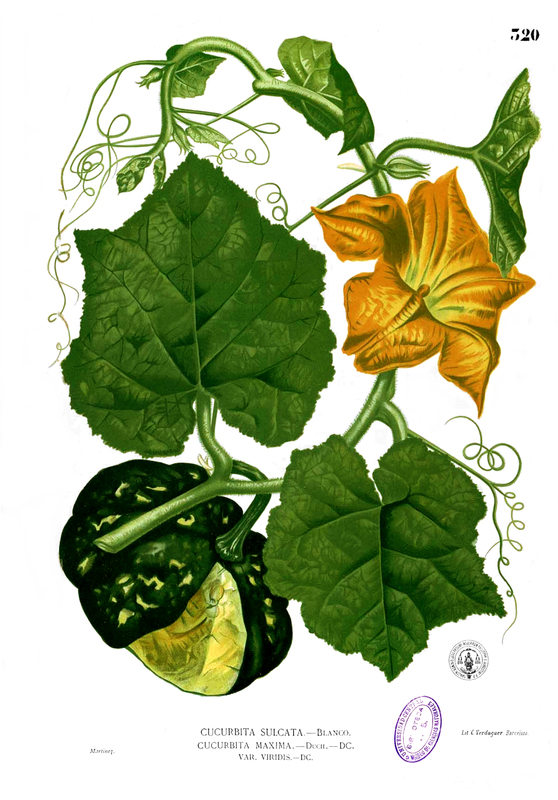 The evidence was found by archaeologists that the cultivation and domestication of Cucurbita moschata dated from 4,000–3,000 B.C. in Peruvian sites and from 1440–400 B.C. in Mexican sites. According to the USDA, one cup of pumpkin (raw) contains 30 calories, 1.16 grams of protein, 0.12 grams of total fat and 7.54 grams of carbohydrate which includes 0.6 grams of fiber and 3.2 grams of sugar. The same amount of 116 grams offers Vitamin A about 70%, Copper about 16% and Iron about 11%. 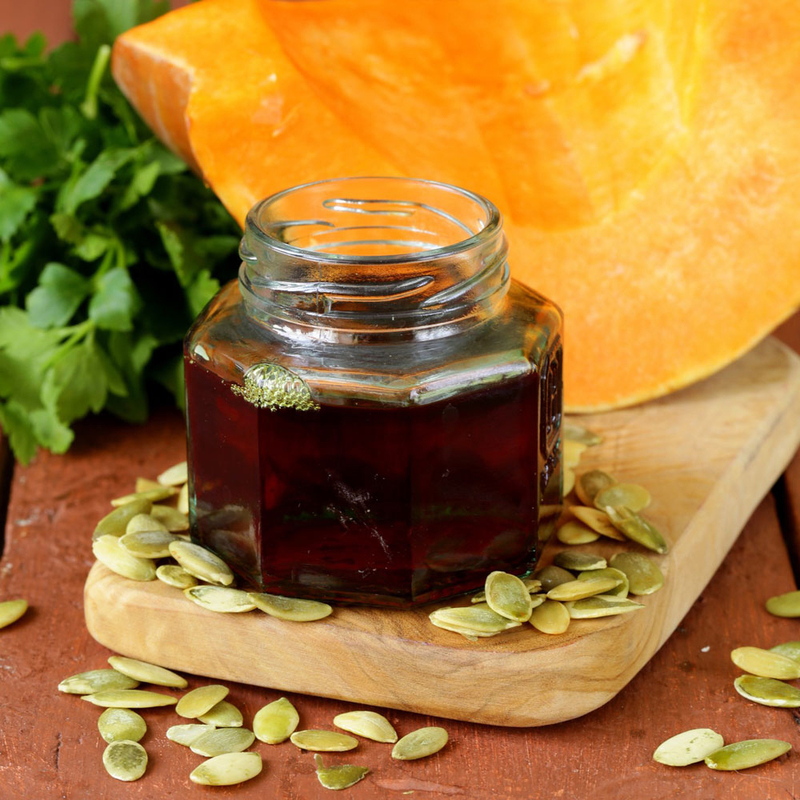 The pumpkin provides various benefits to the health along with its consumption. It promotes the heart health, sleep, prostate health and provides various antioxidant benefits. It enhances the mood, eyesight as well. It also makes the skin look younger. The study shows that the intake of Vitamin A treats several cancers by controlling the malignant cells. The retinoic acid is essential for cell differentiation, development and cancer treatment. The researchers found the evidence that the molecular mechanisms found in retinoic acid has the ability to control cancer cell’s fates. The addition of retinoic acid as a supplement to a diet helps to prevent the cancer development. Vitamin A is essential for the regrowth of skin and wound healing. It is required to assist the epithelial cells both externally and internally. It works as a powerful weapon to fight against cancer. Vitamin is essential for the formation of glycoproteins, sugar and protein combination that binds the cells together to form soft tissues. Vitamin A deficiency in the body results in poor complexion. The studies have shown that Vitamin A helps to eliminate acne and improves the skin health. It helps to produce more collagen which keeps the lines and wrinkles at bay. It keeps the skin look young and contributes healthy hair. An adequate amount of Vitamin A is essential for the smooth functioning of immune functions because Vitamin A helps to regulate the genes that are involved in immune responses. It is required to counteract the autoimmune diseases, cancer, common colds and flu. Beta-carotene also enhances the immune system that helps to eliminate chronic illnesses. The study shows that the children who intake Vitamin A supplements, the health ailments such as diarrhea and malaria was reduced. It shows that the supplements of Vitamin A are useful to treat these medical issues in children. The research conducted on the copper and brain function shows that the copper therapy on neurodegenerative disorders such as Parkinson’s or Alzheimer’s disease was positive. The intake of high levels of Copper can result to copper poising and results brain function impairments. The research has shown that the deficiency of copper can raise the chances of impaired brain function and age related cognitive decline. Copper and iron is essential for the synthesis of red blood cells and hemoglobin. Copper assists in the iron absorption from an intestinal tract and releases the iron to be released to the liver where it is stored. The iron helps in the creation of red blood cells. Due to the deficiency of copper, the level of iron also declined which is the cause for anemia. The symptoms of anemia are muscle aches, fatigue, impaired brain function and digestive problems. Copper is vital for the functioning of brain pathways such as galactose and dopamine which are the neurotransmitter essential to maintain energy, mood, outlook and focus. The copper deficiency results on fatigue, poor mood, low metabolic activity as well as concentration problem. Copper along with Vitamin C and superoxide dismutase, tyrosinase and ascorbate oxidase helps to eliminate free radicals damage in brain and delays the aging process. It also prevents neuro-degenerative diseases and cancer. The adequate amount of iron in the blood assists in maintaining mood which depends upon the hormone balance such as dopamine, serotonin and others. The low level of oxygen cannot synthesize the brain functions. Due to this iron deficiency results in sleep disorders, poor mood, lack of motivation and bad sleep. Vitamin B2 helps to deal with the painful headaches caused during migraine. Physicians recommend riboflavin in high dose to treat headaches or migraine attacks. The riboflavin supplements assist in reduction of migraine frequency, reduce its symptoms as well as pain during migraine and also shorten the duration of migraine. The intake of potassium rich foods helps to reduce the muscle cramps and improves muscle strength. Muscle cramps are the result of low level of potassium present in the body. It also happens when the person becomes dehydrated and doesn’t intake adequate amount of potassium before and after exercise. The studies have shown that the high intake of potassium rich foods increases the density of the bones which prevents the age related disease such as osteoporosis. It is also effective for the older men and post-menopausal women. The young shoots and leaves are used as vegetables and added to stews and soups. 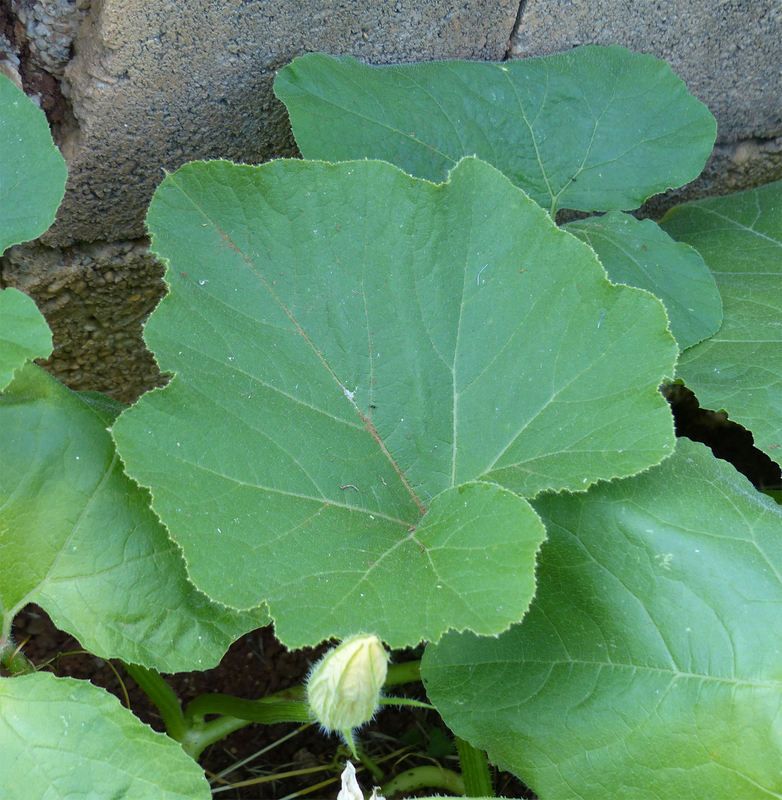 The pumpkin blossoms are consumed raw or cooked. Pumpkin flowers are consumed by frying with onion, fish and tomato. The fruit is used in stews, jams, pies, curries and custards. The powder form of flesh is used with cereals to make bread and cakes. The mashed or cooked pumpkin flesh is good for babies. 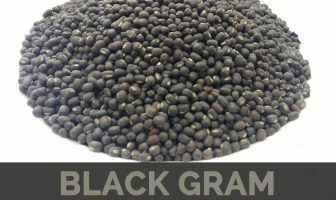 Seeds are consumed dried, raw, roasted and as a snack food. The seed products of pumpkin are used for bread fortification. The seeds are used fresh or roasted to soothe abdominal cramps, distension caused due to the intestinal worms. An emulsion made from seeds is useful to eliminate tapeworms and parasites from the body. 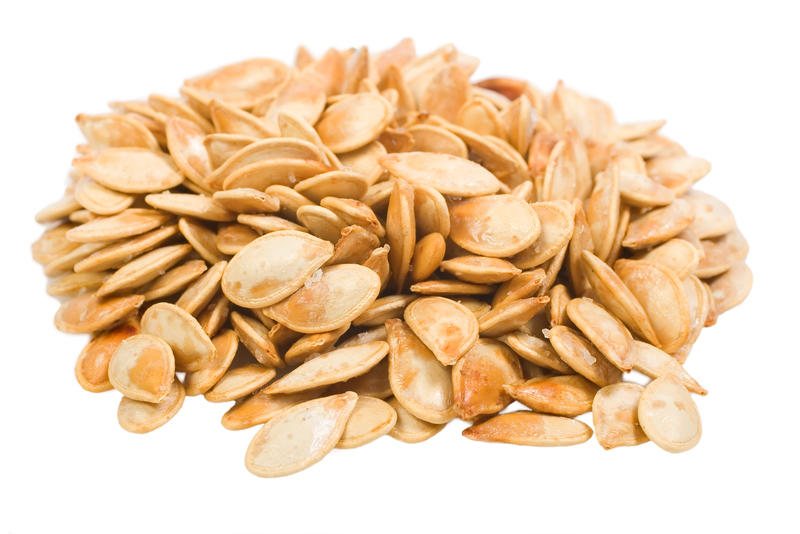 Native Americans uses pumpkin seeds for treating intestinal infections and kidney problems. The flowers are used to soothe minor injuries. Root is used as galactogue by boiling. Pumpkins are a member of the gourd family including cucumbers, cantaloupe, honeydew melons, zucchini and watermelons. The largest pumpkin weighs about 2,020 pounds. 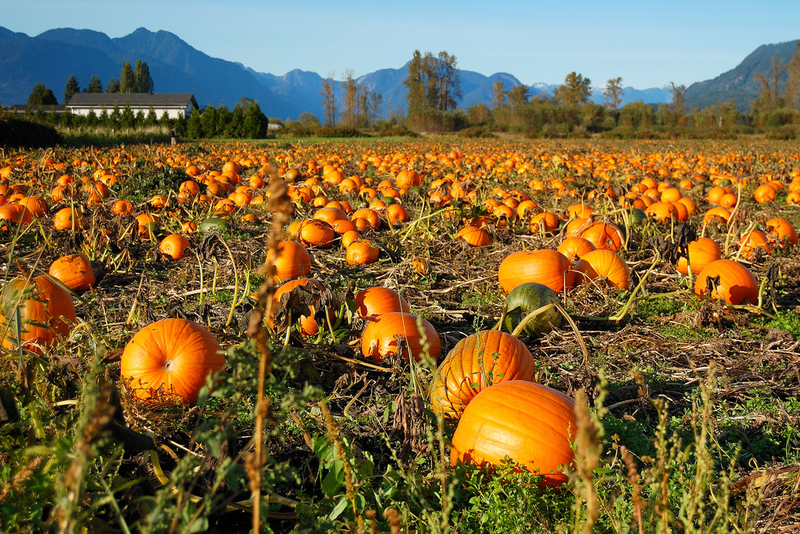 Pumpkins were grown in North America for about 5000 years. Pumpkins are low in fat, calories, and sodium also rich in fiber. They are also excellent sources of Vitamin B, Vitamin A, protein, potassium and iron. 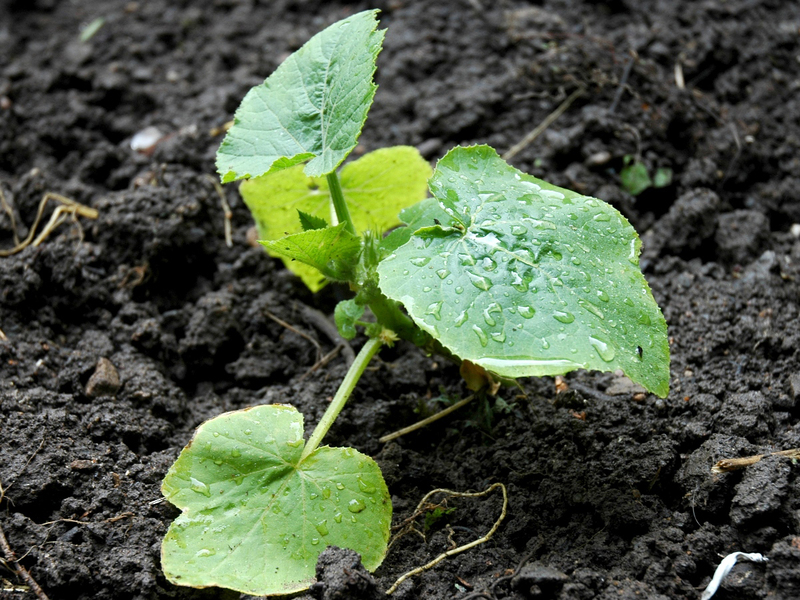 The seeds of the Pumpkin are planted between last week of May and middle of June. The word pumpkin is derived from the Greek word ‘pepon’ which means ‘large melon’. About 90 percent of water is present in pumpkin. The flowers of pumpkin are consumable. 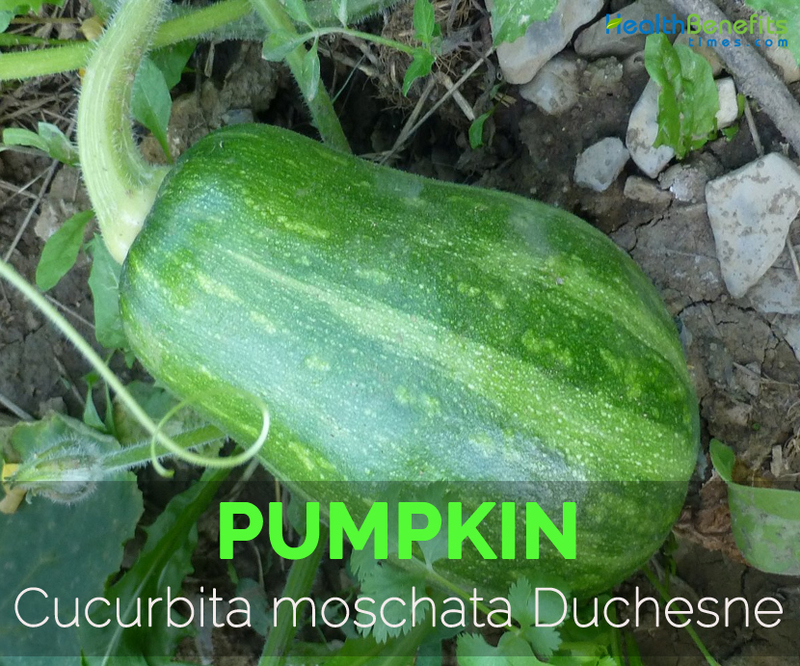 Cucurbita moschata (Duchesne ex Lam.) Duchesne ex Poir. Cucurbita moschata var. colombiana Zhit. Calories 30 Kcal. Calories from Fat 1.08 Kcal. Calories 49 Kcal. Calories from Fat 1.53 Kcal. Calories 44 Kcal. Calories from Fat 1.53 Kcal.